When was the Compass invented? Historians tend to agree that the Compass was invented in c.206 BC and the first known use of the Compass was during the Ancient World period of inventions (3500 BC - 600BC). Who invented the Compass? The name of a specific person has never been credited with the invention of the Compass, the device is so old that the name of the inventor has been lost over time, although the first use of the Compass is believed to have originated in Ancient China. The invention of the Compass is considered a momentous achievement in the field of Science and Technology. 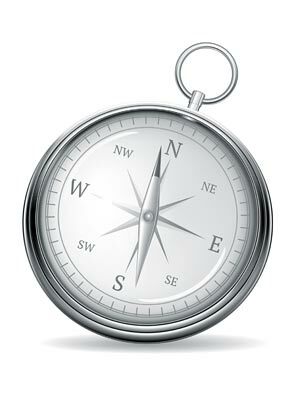 Definition of the Compass: The Compass is defined as a navigational instrument for determining directions on the earth's surface by means of a magnetized needle turning freely upon a pivot and pointing in a northerly and southerly direction. The magnetized needle is allowed to rotate so it lines up with the Earth's magnetic field. Fact 1: Who invented the Compass? The name of the inventor of the Compass is unknown but it is believed to have been invented in c.206 BC during the Ancient World era of inventions (3500 BC - 600BC). Fact 2: Who invented the Compass? Prior to the invention of the Compass in c.206 BC, people used the stars, and the sun to navigate enabling to find East, West, North and South. Fact 3: Who invented the Compass? Directions were found at sea using the sun because the sun always rises in the east and sets in the west. The North Star, the Polaris, is the first star to be seen in the night sky, is directly over the North Pole and enabled people to tell where North was. The constellations of stars known as the Great Bear, Big Dipper and Plow all have lines that also lead to the North Star. The South star was more difficult to locate but the Southern Cross, a compact group of bright stars with the two Pointer stars lead to the South Pole. Well known Landmarks, visible from long distances, also helped with navigation. Fact 4: Who invented the Compass? The pole stars were used to navigate because they did not disappear below the horizon and could be seen throughout the night. However, navigation at sea was particularly hazardous due to situations that caused zero visibility, such as dense fog, mists and heavy snow storms, that made it impossible to see the stars. Fact 5: Who invented the Compass? Navigation and exploration was therefore limited during ancient times, there were no accurate maps and sailors were at the mercy of hazardous weather conditions. Only the brave, or fool hardy, ventured far away from land. It should also be remembered that people, right up to the Middle Ages, believed that the world was flat and if they ventured too far they would fall off the edge of the world. Fact 6: Who invented the Compass? The Chinese are credited with the invention of the Compass c.206 BC during the Han Dynasty. It would revolutionize the world of navigation and exploration and provide a stepping stone to accurate map making. Fact 7: Who invented the Compass? The invention of the magnetic Compass by the Chinese is believed to have been originally developed by Feng Shui practitioners to determine the precise direction of a structure or other important objects. Feng Shui is an important Ancient Chinese concept linking the destiny of man to his environment, aimed at ensuring that people lived in harmony with their surroundings. Fact 8: Who invented the Compass? The Luo Pan, aka the Feng Shui compass, was the first direction finder however, unlike most compasses, the Luo Pan needle pointed towards the south magnetic pole. Fact 9: Who invented the Compass? The Luo Pan compass was constructed using a lodestone, a naturally magnetized mineral, that automatically points to the south, and a bronze plate. Fact 10: Who invented the Compass? The Chinese later developed another 'South Pointer' compass that was made by using an iron pointer, that had been rubbed with a lodestone. The magnetized iron pointer was mounted on a piece of wood that was floated in a bowl of water. The water enabled the wood to move around until the iron needle was pointing south. Fact 11: Who invented the Compass? The 'South Pointer' compass was the navigational device used by Ragnar Lothbrok, brilliantly played by Travis Fimmel, in the television series the 'Vikings'. The character Ragnar Lothbrok is also seen using a Sunstone, a cordierite polarizing crystal, to locate the sun in a completely overcast sky and aid navigation in the open sea. Fact 12: Who invented the Compass? The use of the 'South Pointing compass' for navigation by the Chinese was documented during the Song Dynasty (960 AD - 1126AD) but it was probably used before this date as a closely guarded secret. Fact 13: Who invented the Compass? The Chinese alchemists realized that the magnetite ore would point towards a magnetic north and developed a magnetic 'North Pointing' or 'Dry Suspension Compass' made from lodestone. The Dry Suspension Compass, often in the shape of a turtle or fish, was suspended by a silk chord. If rotated, the needle at the tail would always point in the northern cardinal direction. Fact 14: Who invented the Compass? It is said that the 13th century explorer Marco Polo (1254-1324) brought a compass to Europe following his travels in China, although the compass was probably in use in the West long before this time. Fact 15: Who invented the Compass? During Medieval times the compass was viewed with great suspicion as lodestones were believed to have magical powers and denounced as an instrument of Satan. However this was soon forgotten as Europe entered the Age of Discovery as trade routes expanded and great explorers brought back untold wealth from the New World. Fact 16: Who invented the Compass? The Mariner's compass was invented during the Medieval era which not only delineated North but also helped to locate the ship’s position. The device had two or more magnetic needles permanently attached to a card, which moved freely upon a pivot. The Mariner's compass was read by referring to a mark on the box representing the ship's head. The card was divided into 32 cardinal points and encased in a glass-covered box to keep it safe. It was mounted on brass gimbals to to preserve its horizontal position and keep it steady on a moving ship. Fact 17: Who invented the Compass? The Italian mariner Flavio Goia (c. 1300) is credited with inventing the Mariner's compass by using the method of suspending the magnetic needle upon a perpendicular pivot so that it would remain horizontal despite the movements of a ship. Fact 18: Who invented the Compass? The Bearing compass was developed in 1728 and used for map making to determine geographic direction, usually consisting of a magnetic needle horizontally mounted or suspended and free to pivot until aligned with the earth's magnetic field. Fact 19: Who invented the Compass? The invention of the Compass enabled seamen to calculate heading It was then used used with a sextant to calculate latitude, and with a marine chronometer to calculate longitude. Fact 20: Who invented the Compass? Liquid-filled Magnetic compasses were developed in the early 20th century using a magnetized needle or dial inside a capsule completely filled with a liquid. Fact 21: Who invented the Compass? The invention of the Earth inductor compass was made in 1924 to provide pilots with a more reliable reference instruments by the American inventor Morris Titterington. Fact 22: Who invented the Compass? Navigational capabilities have improved even further in recent years by modern devices such as the Global Positioning System (GPS).